The super sweet and talented Katie from Sew Woodsy is here today with a guest post while we are off in TN. Hi! A Glimpse Inside readers! I'm so excited to be here today. My name is Katie and I blog at Sew Woodsy with my husband, Jon (dubbed Mr. Woodsy on the blog). We are a husband and wife DIY team. We document our journey of homeownership one tutorial at a time. Sew Woodsy is a place where we share our love for renovating and decorating on a budget. We have quite a few great tutorials to get your backyard ready for summer such as our outdoor fire pit, how to build a timber garden border, and natural log pathway. We also have created our very own bean bag toss to use year after year during the summer months. We've had this ladder golf game for a while in our home. Mr. Woodsy built this game 6+ years ago for our engagement party. The party took place in the middle of June. 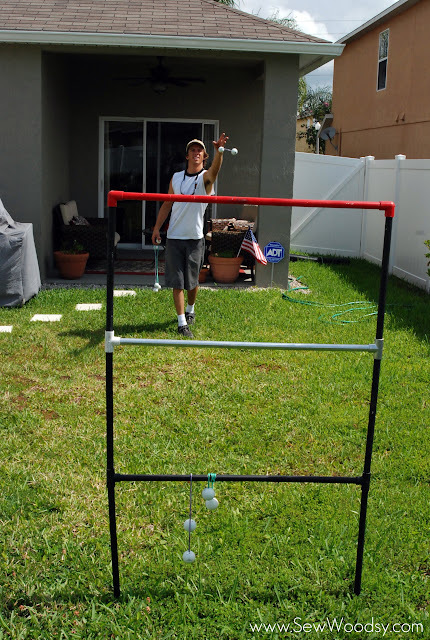 We had a bbq lunch (our mothers cooked all the food for 50+ guests; bless their hearts), a frozen margarita machine (because by June it's deathly hot in Florida) along with beer and sodas, tents and tables for people to sit, and the highlight was not one, but two of these ladder golf games. Our guest were lining up to wait their turn to play. Any time we entertain we take these easy-to-assemble/disassemble games out of the attic and set them up in our backyard. This is an ideal game for summer and best of all you don't need a lot of tools to create the game! (8) 16-inch 1/2-inch PVC pipe *side pieces to connect main bars together. 1. Measure all of your pipe. *Note: we spray painted our game after it was initially built. All connector pieces were spray painted black the middle main bar was spray painted silver, and the top main bar was spray painted red. We did not chose these colors for any particular reason--that's just the spray paint we had on hand. 2. Using PVC pipe cutters cut your pipe to size. 3. Then begin banging in the (8) 1/2-inch PVC T-Connectors to the silver & black main bars of the game. 4. 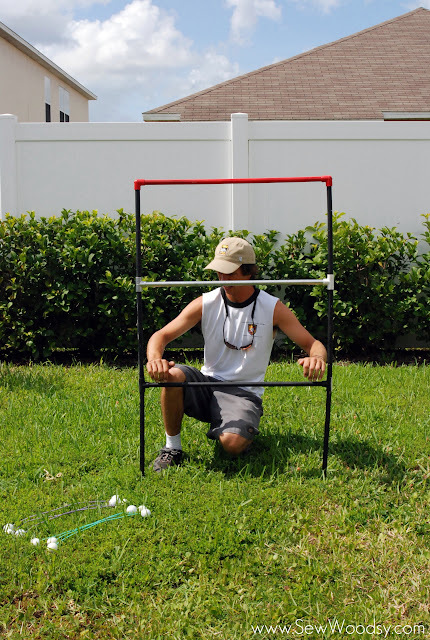 Next, bring the set outside, and begin laying out the pieces to be built. 5. 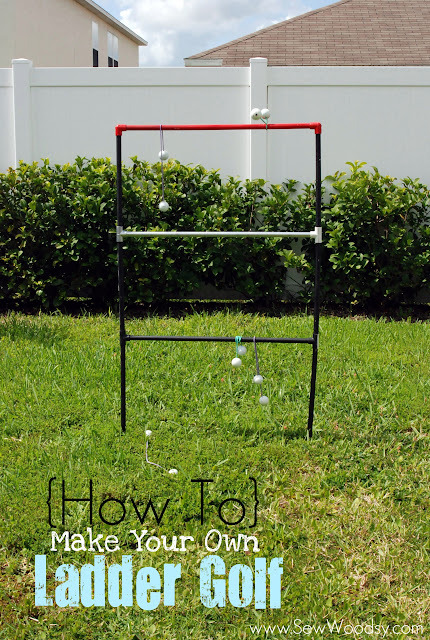 Build the golf balls on strings also widely known as "bolos". Place a golf ball in a vise to hold the ball steady. Drill through the center of each golf ball with a 1/4-inch drill bit. There are two ways you can do this. (option 1) Tie a knot in one end of the nylon rope. Push one ball against the knot and tie it in place with another knot. Measure 12--inches from the second knot and tie a third knot. Push next ball over, tie in place and cut leftover nylon rope. Repeat until all of your "bolos" are complete. (Option 2) Drill a 1/4-inch hole through each of the golf balls. Pull the nylon rope through and secure with hot glue. Cut off excess nylon. Repeat until all of your bolos are complete. 6. Now, its time to build your ladder. 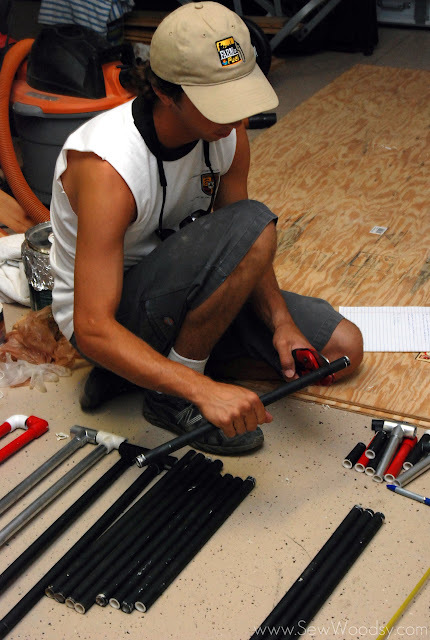 Start by connecting the 19-inch long piece with a T-connector, followed by the 32-inch black ladder piece. Then, build up by attaching two 16-inch pieces to each side to another T-connector. Add the 32-inch silver ladder piece. Lastly, add two 16-inch pieces to each side of the existing T-connector and secure the 32-inch red ladder piece with elbow connectors. 7. 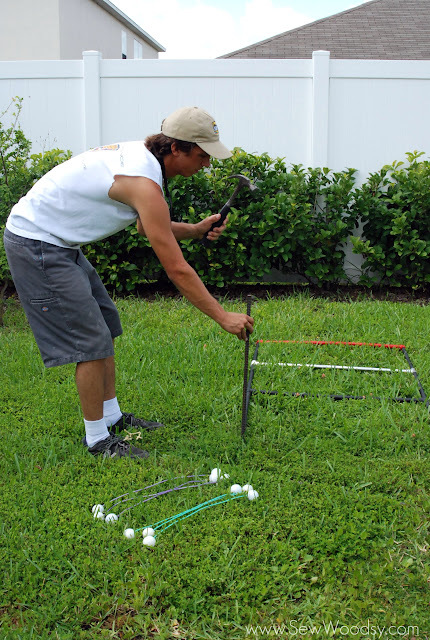 Begin securing the rebar in the ground; using a hammer, hammer in a good 10-15 inches into the ground. 8. Add the second rebar to the ground spaced exactly 32-inches apart. 9. Carefully, slide the ladder over top of the rebar. This is why you will want your 19-inch pieces to be 1/2-inch thin walled PVC. The rebar will fit snuggly inside the PVC allowing to holding up the game. 10. Lastly, ensure that your ladders are all level. Repeat, by building the second ladder (parallel) 15 feet apart from the first ladder. Now, what are you waiting for, go play! You can play individually against one-another or in teams of 2. If you play individually you each get a color of bolos--if you play in a team setting you still each get a set of colored bolos; however, each team will use the same bolos. Players on the team will each take their turn tossing their 3 bolos each opposite of the ladder they are standing at. Once both teams have tossed their bolos points will be added up for that team. The team with the most points wins! The way we score is 3 points for the top ladder (red), 2 points for the middle ladder (silver) and 1 point for the bottom ladder (black). We typically play until you reach 21 if we are playing just the two of us and if we are in two teams of two then we will play to 50. There is no wrong or right way--you can decide what point value you want to give each of the ladders if you don't want to play how we do. You will want to gently toss the bolo underhand in hopes it will land on the top ladder for the most points. 3 points and we have a winner! *Note, we did not glue any of the PVC pieces together. We like to be able to take a part the entire game, tie it together using twine and store it in our attic when its not in use. You could glue the pieces together if you wanted to build this permanently. You can also make "T" like feet instead of using the rebar method we use if you only have concrete near by. 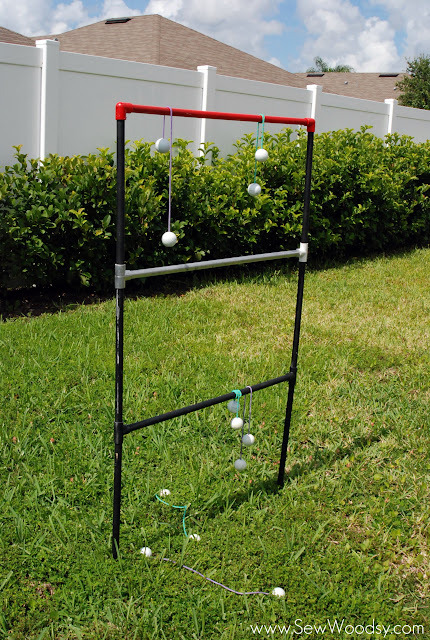 I hope you enjoyed learning how to make ladder golf! We would love for you to stop by and visit us over at Sew Woodsy! Get social with us and follow us on Facebook, Twitter, Pinterest, and YouTube! Thanks so much for guest posting Katie! !